Measuring the Acidity of an olive oil is the oldest product control and classification system used for oils, even if it is not alone sufficient to define the overall quality of a product. The product categories of olive oil have been coded by the European Union in Directive 136/6623/ECC, Reg. EC 2568/91 and, finally, in Reg. EC 1989/03 according to its acidity. The official method foresees the titration of free fatty acids with an accurately standardised solution of sodium (or potassium) hydroxide and the use of phenolphthalein as indicator. Prior to this, the oil must dissolved in a solvent (ethanol/ethyl ether) and titrated, drop by drop, by means of a graduated burrette. The use of a titrator for the measurement of Acidity (FFA) in olive oil is a time-consuming process and requires the availability of a skilled operator capable of using burettes and other type of glassware, and to determine the end-point required to detect the end of the titration. Furthermore, this method of measurement of the Free Fatty Acids of oil requires particular expedients like the use of a suction hood for the preparation of the mixture of ethanol – ethyl ether or the absence of free flames or running electric heaters in close proximity. In addition to titrators, there are also commercial acidometers that are based on the same principle. The use of the acidometer as a means to measure the acidity of an olive oil simplifies the method, but the results obtained are less accurate and sensitivity is often poor. The Acidity of olive oil can also be measured with CDR OxiTester a system that uses a simple, fast and reliable method to determine this important parameter. 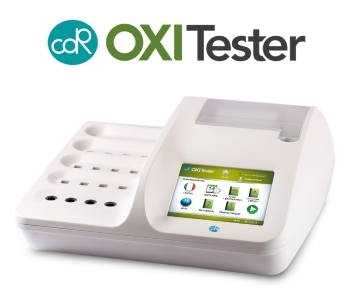 CDR OxiTester is an analysis system composed of thermostated analyzer based on photometric technology and some kits of dedicated, pre-vialed reagents specifically developed by the research laboratories of CDR, uses a simple, fast and reliable method to determine this important parameter. With this system, the acidity of olive oil can be measured even by unskilled operators without any experience in the field of chemical testing. The analyser is in fact supplied fully calibrated and ready for use. To measure Acidity, it is sufficient to insert the exact amount of samples in a pre-vialed test tube containing the required reagent, shake the tube and read the result. In other words, it is not necessary to determine the end-point and be able to use a burette, which means that it is possible to run the test in the office without getting messed up. The acidity of an olive oil can be measured immediately, there is no waiting time and at the end of the test, it is not necessary to wash containers or test instrumentation or clean traditional “glassware”. Take a look at the video! Watch how to measure the acidity content of olive oil with CDR OxiTester. As compared to other commercially available acidometers, CDR OxiTester is able to measure the acidity of an olive oil with a measuring sensitivity that is 10 times greater, and thus enables to determine differences down to 0.01%. Furthermore, CDR OxiTester simplifies the testing method as compared to that for laboratory titration because it does not require the standardisation of test solutions that are exposed to the risk of degradation. Click for more information about CDR OxiTester: Simple to use – AOCS compliant results in a few minutes. Measuring the Acidity (FFA) of an olive oil was last modified: February 8th, 2019 by CDR s.r.l.